Stockopedia began as a UK service but has grown to offer subscription packages in the UK, Europe, USA, Canada, Developed Asia, Australasia and India. Each of these regions can be purchased standalone or in combination. Cross Region subscribers on many sites can struggle from data overload. We've tackled this problem by providing an innovative feature we call "Focus Mode". Essentially it allows cross region subscribers to zoom in as if they had only subscribed to a single region. This provides an unparalleled facility to research the world's stock markets in aggregate or individually, at home or abroad. How can you switch focus? Simply hover over the flag icon (next to the logo) in the site header to focus in on an Edition from those available under your subscription. To unlock more markets, simply upgrade your subscription from the plans page. What is the impact of changing focus? Stock screens will run across the selected edition. Please note that we have a lot more performance history for the UK, European and US services because these GuruScreens were launched earlier (in December 2011 for the UK, later for the others). StockReports - stock reports are unaffected by focus mode. Stock Reports are still available to search for and view in foreign markets even when in Focus Mode. 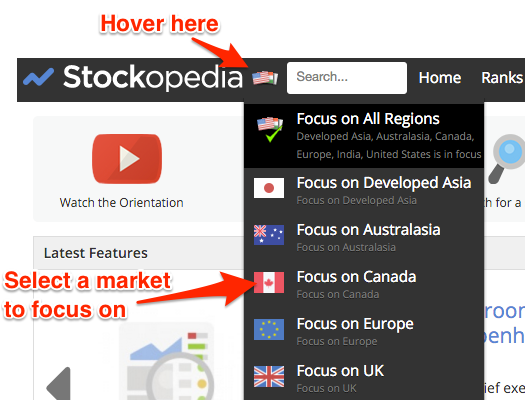 So you can still view a US stock while in UK Focus mode. In 2016 we introduced the Region Dropdown menu. This feature is available on all stock screen or directory tables and other data displays (e.g. bubble charts and chart grid views). This menu shows all the countries and regions that you have access to in your subscription. So while you may be in European Focus Mode, or be a European subscriber, you'll be able to narrow stock screen results to just the Germany, Belgian or other country. What future Regions are likely? Our goal is to provide the ability to view the world's stock markets both on a subscriber's national level (e.g. UK, France, Germany) and across broader geographies - e.g. EMEA, Asia, South America etc - and the entire globe. We also intend on launching 'Custom Editions' for subscribers who wish to mix and match their own set of markets. The full globe's geographies may take some time to bring onto the platform. Before then please review the plans page to see what has been released to date. The great benefit of providing this feature is that investors can view Stockopedia and their stocks from the perspective of their benchmarked area. If an investor runs multiple portfolios - for example a UK equity portfolio and a global equity portfolio - he or she can view stocks ranked from the perspective of the underlying market basket. Small equity markets (e.g. Greece) may not provide many screening candidates, and ranks and averages may become fairly meaningless across industries and sectors. It is better to use larger markets such as the UK or European area as a whole to analyse and screen across.